FirstChoice IPO Analysis: WORLD’S RICHEST MAN GOES MISSING. Muammar Gaddafi, the undisputed leader of Libya, till yesterday, has gone missing. Gaddafi a military officer, who seized power in a military coup in 1969. He abolished the Libyan Constitution and adopted laws based on his political ideology. His nearly-42 years in power have made him the fourth longest-ruling non-royal leader since 1900, as well as the longest-ruling Arab leader. 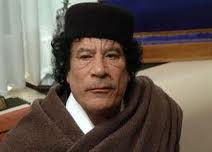 The estimated wealth of Gaddafi across the continent is around $ 70 billion, making him as one of the richest man in the world. Out of the above, around $ 35 billion are stashed in various banks of US, UK and Canada. Labels: WORLD’S RICHEST MAN GOES MISSING.